En effet, la gourde tient debout une fois remplie et peut être attachée à une ceinture ou un sac grâce à son mousqueton. Cette gourde souple et flashy est idéale pour vous inciter à vous hydrater lors de vos activités sportives et en camping ou pour les excursions et sorties scolaires de vos enfants. Gourde souple avec mousqueton. En effet, la gourde tient debout une fois remplie et peut être attachée à une ceinture ou un sac grâce à son mousqueton. Cette gourde souple et flashy est idéale pour vous inciter à vous hydrater lors de vos activités sportives et en camping ou pour les excursions et sorties scolaires de vos enfants. Gourde souple Sodebo NEUVE. Bouchon rétractable. Pratique pour sport, école. Coloris vert. Très solide, c'est unegourde souple construite pour durer. C'est unegourde qui peut contenir 1 l de boisson. Elle est graduée. Elle a une poignée pour un transport et un maintien facilités : laStow est rapide à ranger et à saisir. Durable et résistante, elle est construite en polyuréthane thermoplastique garanti BPA Free (matériau sans BPA). On peut la congeler et l'utiliser jusqu'à des températures de 60°C. Le bouchon de laSoftflask Hydrapak est étanche et muni d'un verrouillage ainsi que d'une pipette anti-fuite. 4 x BPA Free Foldable Water Bottle. Water2Go foldable water bottle is the new eco-friendly bottle to replace old plastic water bottles. Water2Go is perfect for travel, school, hiking, and many on-the-go activities. Gusseted bottom allows Cantene to stand when full. You will receive: 1 Nalgene Wide Mouth Cantene 96 oz Water Bottle. Fill our flexible canteens with 16-, 32-, 48-, or 96 ounces of your favorite drink. You will receive: 1 Nalgene Wide Mouth Cantene 32 oz Water Bottle. Fill our flexible CANTENES with 16-, 32-, 48-, or 96 ounces of your favorite drink. Available with the loop-top cap or the ATB cap. 1 BINER WITH WATER BOTTLE CARRIER ATTACHED. UN CLIP THE SPRING LOADED BINER WITH EASE. THE NECK BRACE SNUGS FIRMLY UNDER THE LIP OF THE BOTTLE. THIS NEW FLEXIBLE DESIGN ALLOWS THE BOTTLE TO MOVE WITH YOU. Top rack dishwasher safe. BVS20000EP030/0428/3///27A. Reduces waste. FDA food safe. Hydrapak SoftFlask 250ml, Ideal for on the go, light weight and stowable with ease! Whether it’s trails, rivers or slopes, nutrition is just a bite away. And since it holds 8.5 fl oz of your favorite nutrition concoction, you can go the distance without running out. Hydrapak SoftFlask 150ml, Ideal for on the go, light weight and stowable with ease! Whether it’s trails, rivers or slopes, nutrition is just a bite away. And since it holds 150ml of your favorite nutrition concoction, you can go the distance without running out. 10 x BPA Free Foldable Water Bottle. Water2Go foldable water bottle is the new eco-friendly bottle to replace old plastic water bottles. Water2Go is perfect for travel, school, hiking, and many on-the-go activities. You will receive: 1 Evernew Water Carrier. 600ml / 20.3 fluid ounces. Built in shock cord to keep the bottle rolled up for storage. Gussetted bottom allowing it to stand when full. Tapered body mid-section for easier handling when full. You will receive: 1 Evernew Water Carrier. 2000ml / 67.6 fluid ounces. Built in shock cord to keep the bottle rolled up for storage. Gussetted bottom allowing it to stand when full. Tapered body mid-section for easier handling when full. You will receive: 1 Evernew Water Carrier. 900ml / 30.4 fluid ounces. Built in shock cord to keep the bottle rolled up for storage. Gussetted bottom allowing it to stand when full. Tapered body mid-section for easier handling when full. Hydrapak SoftFlask 500ml, Ideal for any type of runner! Take matters into your own hands with the SF500 Handheld SoftFlask. Designed for the minimalist runner, the SF500 is easy to hold with a flexible hand strap. You will receive: 1 Nalgene Wide Mouth Cantene 48 oz Water Bottle. Fill our flexible CANTENES with 16-, 32-, 48-, or 96 ounces of your favorite drink. Available with the loop-top cap or the ATB cap. BPA Free - Mossy Oak. Foldable, portable, flexible, freezeable, reuseable and dishwasher-safe. Wide mouth opening. Simply unscrew the SuperCap from the bottle to reveal the wide opening. Great for filling and cleaning your bottle! I'm sure I will be able to work out any problems that might rise. Bpa Free. 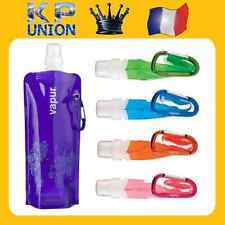 6 Pc Set Of BPA Free Foldable Bottle Water With Carabiner. This new eco friendly bottle of water is the new way to replace old plastic water bottles from piling up. Can be rolled, folded or flattened when empty. Drinks stay cold in the flexible and lightweight Polar Bottle Sport Insulated Water Bottle in blue. Polar Bottle combines the technology of an insulated vacuum bottle with the light properties of plastic. Vapur - Shades 0.5L BPA Free Foldable Flexible Water Bottle [NEW]. The Vapur 18 oz. Shades Water Bottle is lightweight and designed to perform. Foldable, portable and flexible. Reusable and Freezable. You will receive: 1 Evernew Water Carrier. 1500ml / 50.7 fluid ounces. Built in shock cord to keep the bottle rolled up for storage. Gussetted bottom allowing it to stand when full. Tapered body mid-section for easier handling when full.